Ho Chi Minh City has seen a downward trend in dengue-fever disease, but a surge in hand-foot-mouth disease since August, particularly in the new school year, according to the Preventive Health Centre in HCM City. Dr Le Hong Nga, Head of the Centre’s Department of Infection Control, so far this year, hospitals across the city reported 13,763 dengue fever cases, up 22 percent year on year. Over the past six weeks, the number of dengue fever patients visiting hospital for treatment dropped about 10 percent, from over 500 cases per week to around 450 cases. Meanwhile, around 3,410 local children visited hospital for hand-foot-mouth disease treatment in the reviewed period, Nga said. In August, the number of hospitalised children with hand-foot-mouth disease was 10 percent higher than the previous months, particularly in Children’s Hospital 1, Children’s Hospital 2, and HCM City Children’s Hospital. 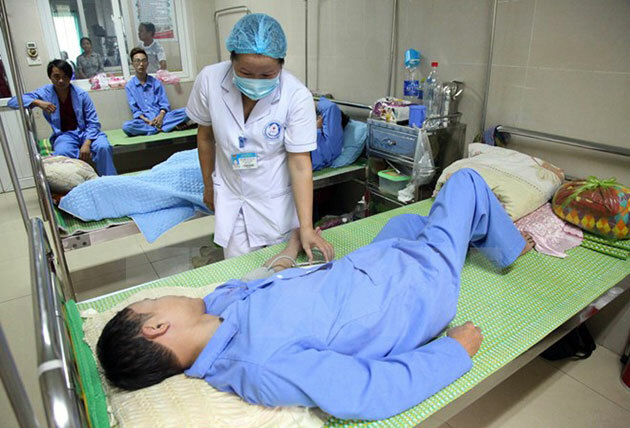 Dr Nguyen Tran Nam, Head of the Department of Infection of the HCM Children’s Hospital said over the last month, the number of children getting hand-foot-mouth disease surged, however, most of them were treated at home. According to Dr Truong Huu Khanh, Head of the Department of Infection and Neurology of Children’s Hospital 1, the disease tended to spread among children at kindergartens, suggesting that teachers should be trained to detect the infection early. According to health experts, hand, foot and mouth disease is most contagious in the first week after a patient is infected and may last for several weeks due to the virus focal in the waste. Signs of the disease are fever, sore throat, oral mucosal lesions and skin mainly in the form of scalds commonly found on the palms, soles of the feet, knees and buttocks. The hand-foot-mouth disease mainly occurs in children under the age of 10, and particularly in those under five. The smaller the child is, the more serious the symptoms are. Pregnant women should especially avoid close contact with an infected person since the virus can be transmitted to the baby either before birth or during childbirth. A person can be infected multiple times because every time he or she is infected, the body produces antibodies to a specific virus. Therefore, even if a person has been infected once, the disease can return if infected with another virus belonging to the Enterovirus group./.